NEW! Aerobiology's Searchable Test Code Database is Now Live! 15 Jan NEW! Aerobiology’s Searchable Test Code Database is Now Live! Can’t find a test code in pinch? Need to double check a turnaround time? 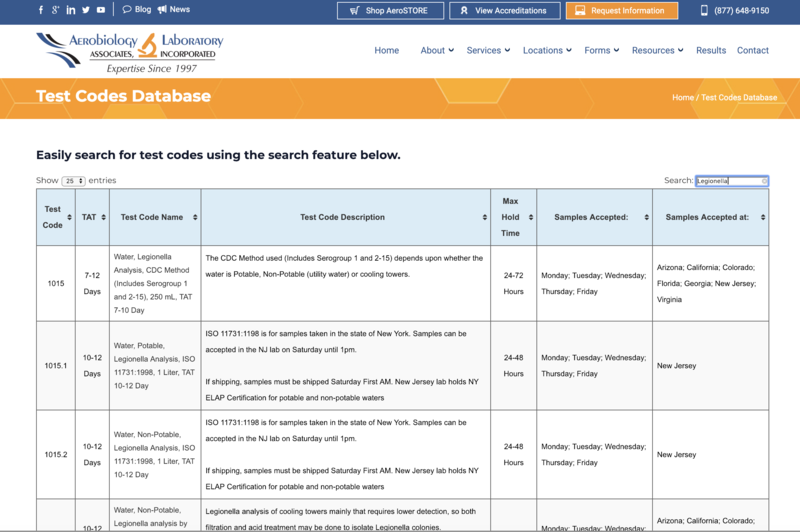 Aerobiology Laboratory’s new Test Code database is now accessible on www.aerobiology.net under the Resources tab, Test Codes Database. This database includes test code numbers, turnaround time (TAT), test code name, test code description, max hold time, days of the weeks samples are accepted and laboratories able to complete the specific analysis. We hope this new tool can assist our clients in their ability to find test codes and provide important information to our clients.